What has Great Britain delivered for the benefit of the rest of the world in engineering terms? I expect that, if you asked a hundred people, you would receive a hundred different lists. May I offer you my selection of just six? The Forth Bridge is a cantilever design and is 2,528.7m long; a cantilever is a beam supported at only one end. Two cantilevers together form each of the three arches. It is no longer the case that “Painting the Forth Bridge” is an endless task. Modern paint technology requires repainting at intervals of fifteen years. However it is still a challenging environment working 100m above the sea. This finds a place even though it is an endeavour shared with the French. She flew for the first time on 2 March 1969. Only twenty were built and Concorde remains the only commercial supersonic airliner. The Russians developed a supersonic airliner, the Tupolev-144, which bore a striking resemblance to Concorde, allegedly as a result of industrial espionage. The Tu-144 crashed at the Paris Air Show in 1973. Ironically, Paris was also the location of the crash of Air France Concorde Flight 4590 on 25 July 2000, which precipitated the retirement of both Air France and British Airways’ Concordes in 2003. The characteristics of Concorde observe a factor of two in comparison to conventional flight. Concorde cruised at between 54,000 and 60,000 feet, nearly twice as high as subsonic flight. 60,000 feet is over 11 miles. Concorde was quite alone up there and had her own flight paths and her own, delightful, call-sign, “Speedbird.” The crew were able to look down on conventional airliners five miles below as they left them behind. At Mach 2.2, over twice as fast as a conventional airliner, she completed the transatlantic journey in less than half the time, three and a half hours as against eight. The record crossing, from take-off to touchdown, was from New York to London on 7 February 1996 and was achieved in 2 hours, 52 minutes, 59 seconds. How I wish I had had the opportunity to fly on Concorde, but like the overwhelming proportion of her admirers, I could only watch in awe. Sir Alec Issigonis designed a car which was intended to be economic in construction, running costs and space in a time when there was a high price of crude oil after the Suez Crisis. Space was saved by mounting the engine transversely, using front-wheel drive, and putting a “wheel at each corner.” The first models went on sale on 26 August 1959 and the descendants are still in production now, although manufactured by BMW. The habit of developing technology and neglecting it only for another nation to pick it up and develop it, is one we will return to. When we expected to fight a war against the Russians, it was recognised that, early in the piece, allied runways would be prime targets. The Harrier was designed to operate from little or no runway – an intact stretch of road would do. As the Sea Harrier, it could operate from a ship, without the requirement for an enormous Aircraft Carrier. The operation to recover the Falklands would not have succeeded without the Harrier and Sea Harrier. The pilots developed a trick called “VIF” – vector in flight; while being pursued by a conventional fast jet, the Harrier pilot could stop in mid-air by engaging downward, rather than backward, propulsion, so that the hunter became the hunted, overtaking the Harrier whose pilot was then able to engage the fast jet, at leisure, with air-to-air ordnance. The Harrier was sold to the USA and, with a recurring theme, the technology was taken on by another nation and developed; the next generation of supersonic combat aircraft will use jump-jet technology. My list is completed by two railway locomotives. Indulge me! So, although the 9F Class was never intended for passenger work, they were very often used to haul passenger trains and could achieve 90mph burning less coal at that speed than other classes, with wheels turning eight times a second. Arguably the best design of steam locomotive as well as the last, they were retired from service prematurely as British Rail sought to cast aside steam as it made an indecent dash to diesel and electric traction. Having rid itself of steam in the 1960s, BR wanted to employ tilting technology, along with electrification, so as to have trains travel ever faster along routes that dated to the 19th Century. This was the Advanced Passenger Train, or APT, which was an expensive and tragic failure. The technology went abroad, rather like the Harrier, for the Italians to sell it back to Britain as the Pendolino twenty years later. But no matter; a requirement was identified in the 1970s for a train to fill the gap between loco-hauled trains and the promise of electrification and the APT, and so the diesel-powered HST was developed. The HST was, therefore, a temporary measure but is still in operation today, and is regarded as the most comfortable ride on the modern railway by all those in the railway industry. 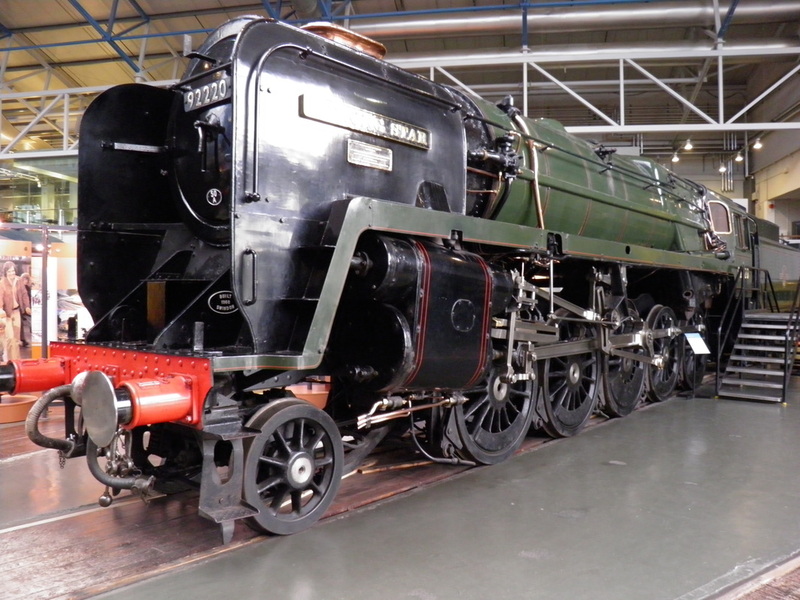 Britain developed the technology to have a locomotive at each end of the train, which means that there is no nausea-inducing vibration from engines beneath the floor, while the axle arrangement makes it light enough to travel almost anywhere on the network. Just 197 power cars were built, and achieve 125mph with astonishing ease. The world speed record for diesel traction is held by the HST, at 143 mph on 12 June 1973. So there we are; six British triumphs held in awe by the rest of the world. One structure, one motor vehicle, two locomotives and two aircraft; three with a railway theme; three, whose technology was shamefully set aside by Britain, to be further developed by another nation. What would you add to my list?